The Pricing Table allows you to showcase the prices for your product, services, or packages in a beautiful and responsive pricing table. 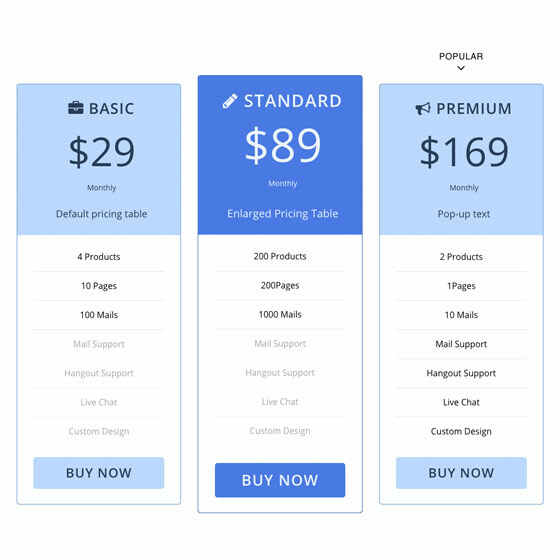 Designed with features that allows you to choose an icon that you can insert beside your header, create a pop-out text with bouncing animation, or enlarge a pricing column where you would like to emphasize a certain price. This addon also gives you the flexibility to customize the header, features list, and button styling. Start creating your own custom pricing table with the Pricing Table addon now! Check out the Pricing Table addon demo page!